Incline senior Ian Smith drives to the basket in the Northern League Championship tournament. 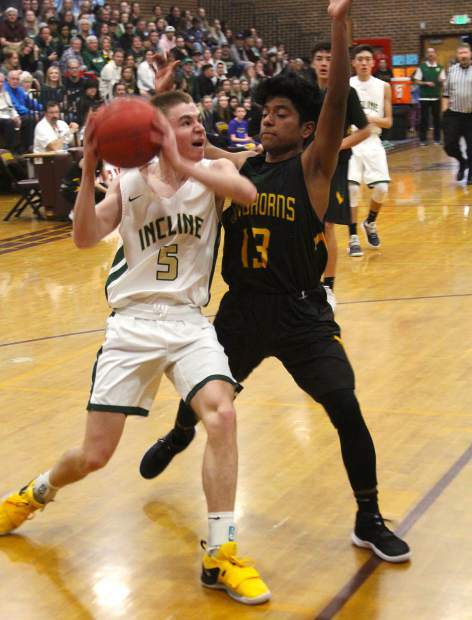 INCLINE VILLAGE, Nev. — The Incline Highlanders finished this year as the best class 2A boys’ basketball team in Nevada, and the postseason awards reflect that success. Three Highlanders earned top honors and six players overall received recognition. Senior Liam Nolan-Bowers and freshman TT Valosek earned defensive and offensive players of the year, respectfully, in the Northern League and senior Ian Smith was voted the Most Valuable Player of the state tournament by the four head coaches in Las Vegas. And all the players were led by the Coach of the Year in the conference and at state, Tim Kelly. Valosek, Smith and Nolan-Bowers were also first team All-Leaguers, and they all made first team All-State, seniors Johnny Redfern and Matthew Cornell made the second team and sophomore Brad Rye earned honorable mention. Redfern also earned second team All-State. Smith was the Highlanders co-captain and Kelly referred to him as the best player in 2A in the second half of the season. Smith averaged 13.6 points, 4.3 rebounds, 2.8 assists and 2.4 steals per game and was Incline’s leading scorer in each state tournament game on his way to becoming MVP. Valosek was beyond his years a freshman. He led the Highlanders in points with 15.5 per game and that was second best in the league. He also was second on the team in rebounds (5.3) and assists (2.3). Nolan-Bowers was a ferocious rebounder and defender. He scored a modest 5.9 points per game but led the league in rebounding (8.2) and was second in blocked shots. Redfern scored 7.3 points per game and usually filled out the stat book with blocks, rebounds, assists and steals. Redfern made his biggest impact in the state championship game with a big block late and a couple of early 3-pointers. Cornell averaged 2.3 points and 3.3 rebounds but was a key physical presence in the paint. Rye was a defensive specialist, only because Incline didn’t need him to score a bunch, but the gifted athlete will likely score a ton of points in the future. Kelly’s Highlanders won 25 games this season, a single season best since he took over in 2012-13, and claimed the first league and state championships in his seven years at the helm.